Why all the fuss about human rights? I’ve worked in care in one capacity or another since I first volunteered as an unemployed school-leaver in 1981. Over the last 30 odd years I’ve been privileged to see some amazing developments in the way that vulnerable people are treated by society and by the caring professions. I’ve met some incredible, inspiring people and watched in awe as people overcome seemingly insurmountable odds, sometimes as a result of the care they receive and sometimes in spite of it. It’s been and continues to be a fantastic career, witnessing human growth and potential that would have been impossible without this country’s extensive package of human rights protections. That’s why, some years ago, long before Brexit I wrote this little PDF. It outlines just why I love the European Convention on Human Rights, not just in relation to care services but because of its benefits for society as a whole. If you’re at all unsure why so many care workers and others fear for our rights post-Brexit please download ‘The convention‘ and see just what the fuss is about. 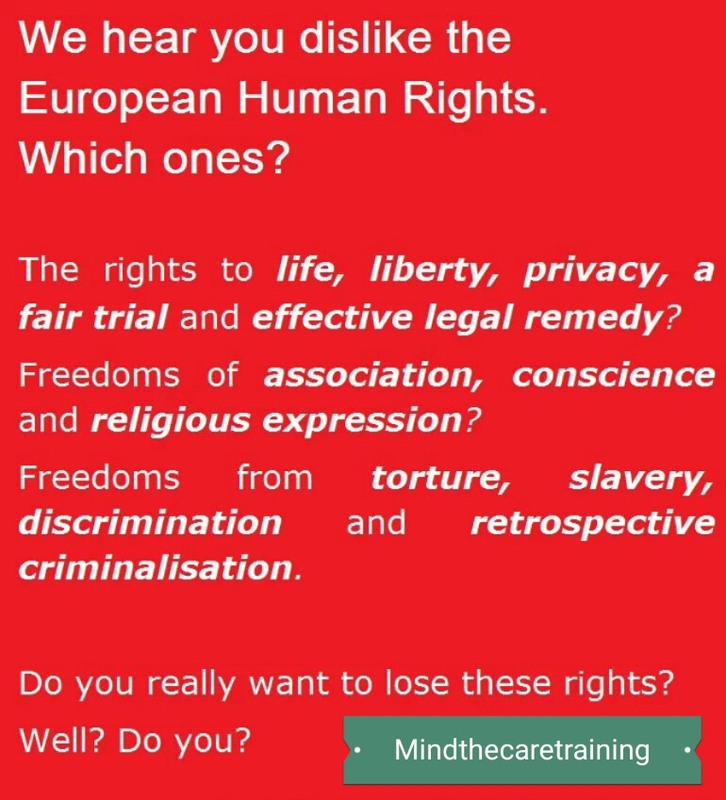 New seminars and training on human rights coming soon. It’s important for care workers to know what we risk losing. That way they have a chance to help keep our rights.